As Paul reported here a couple days ago, Barron’s textbook publishing division produced a monstrous book equating Justice Clarence Thomas with fascists and the KKK. I too was stunned to see this from the Barron’s stable, as Barron’s weekly is my favorite financial publication, and it employs many ideologically sound writers (Tom Donlan, Gene Epstein, etc), which suggests their management has their head on straight. Yesterday Barron’s announced it will withdraw the book and destroy existing copies. I think their explanation of how it happened is a lame and incredible (I suspect some author or editor made the “condensation” this way deliberately), but good for them for acknowledging they screwed up. 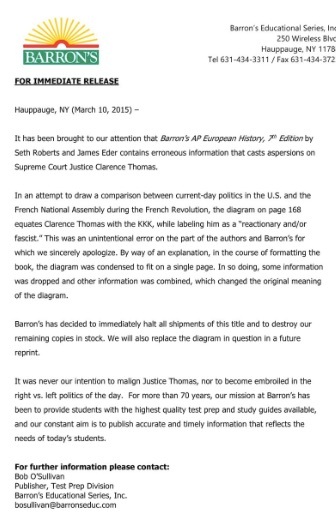 Here’s the screen cap of their retraction announcement, which is a little hard to make out (but I haven’t found a better version yet), and here’s the Free Beacon story which may be more useful. That’s one biased textbook down, and just 3,000 more or so to go.